Students consider what content or questions generated from a previous investigation within the seminar to use as subtext for the allotted zones within this movement phrase. 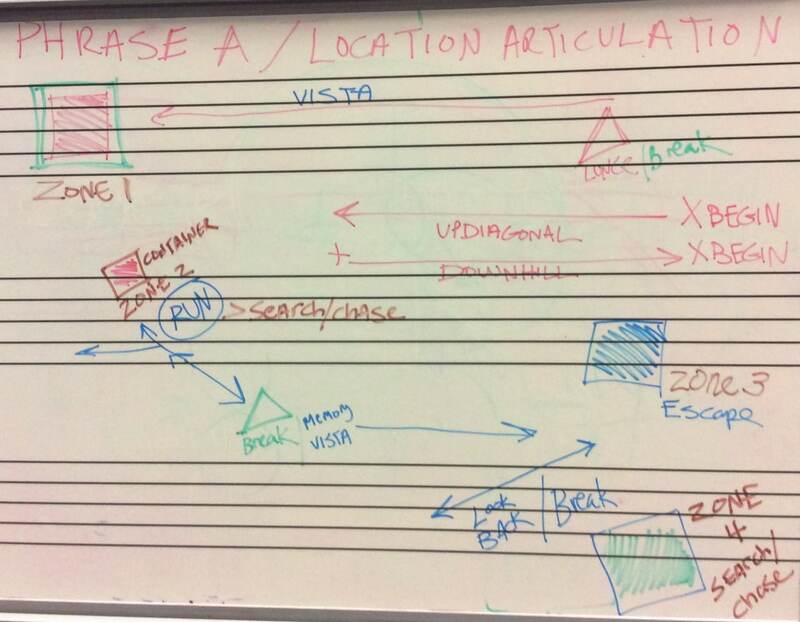 Working on “Phrase A” in class today – articulating the location, the toggle between real time and narrative time. The zones within the work allow space for cross application of ideas as well as a personal rendering of the material. Encountering and articulating space and time in this way re-introduces them as an actual medium. For most students here, integrating their own experiences as a material within pre-existing creative conditions and investigations if a first. Moving into the role of author, researcher and inventor is powerful. Phrase A establishes some of the major movement vocabulary that will inform the evening length work we are builiding, “Portal 1812”. Learn more about this seminar and other courses and workshops here.